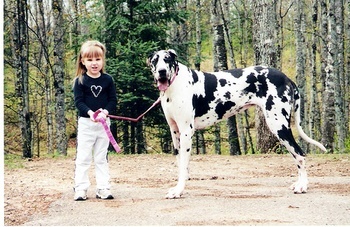 Truly great, as much in majesty as in size, the Great Dane is one of the largest dog’s in existence. A gentle giant, the Great Dane possesses a friendly and playful disposition. It’s an ancient breed, with similar-type dogs appearing in frescoes and other artwork from Greece and Egypt dating to more than 5,000 years ago! A 5th Century Danish coin depicts a large hunting dog believe to be a Great Dane. The most striking feature of the Great Dane is their massive size. Minimum standards dictate that male Danes are not less than 30 inches tall – 32 inches and above is preferable (females can be slightly smaller, standing only 28 inches or more). Their weight ranges from 100 pounds for females to 120 pounds for males – while the AKC no longer states a minimum weight, those are generally accepted standards, however, the tall dogs should appear well muscled and proportionate to its great height. Their large size makes Great Danes easily identified, and their presence will draw attention from everyone in the immediate vicinity. The largest living dogs are usually Danes – currently the Guinness Book of World’s Records recognizes a black Great Dane named Zeus as the tallest dog at 44 inches at the shoulder. Prior to Zeus, Great Danes named Gibson, Titan and George held the title. While similar-looking dogs from throughout Europe and the Middle East are believed to be Danes, or at least an early iteration of the dogs, the breed likely started in England and then was perfected in Germany. It is believed that the foundation of Great Danes is largely a cross between the long-legged Irish wolfhound and the large, solid mastiff. While no official, consistent breed was established between the crosses, the dogs were brought from England and dispersed in noble courts throughout Europe. German nobility took particular interest in the massive dogs, which were used to hunt wild boar, and are generally credited with establishing the breed and standards. When boar hunting waned, the dogs were used as guards for estates and then companion animals. The Danes, not surprisingly, also lay claim to developing the large breed, with Frederick VII searching out suitable breeding stock and undergoing a consistent breeding program. The name “Great Dane” is largely a political name, which won the popularity contest after years of being known by other names; Germans lobbied for a name that reflected that country’s contributions to the breed but eventually lost out. As massive as the dogs are, Great Danes are as equally caring, lovable and friendly. They get along well with other dogs, pets and children. Training is highly recommended because of their massive size; basic obedience and control during walks are important to incorporate into their upbringing – they’re so big, even a small jump (or their propensity to lean against and love on a person like an oversized lapdog) or pulling on a leash could cause problems for an owner. While they need daily exercise, they tend to be more laid back dogs whose primary role is that of companion and family pet. Because of they are a giant breed, Great Danes have short a short lifespan – living only 6 to 8 years on average. They are susceptible to several issues, including bloat, skeletal problems (especially growing puppies) and a few other genetic disorders. At Paw Print Genetics, Great Dane owners can select a panel screening that tests their dogs three for known genetic mutations. Included in the panel are the tests for inherited myopathy of Great Danes, harlequin coat color and dilute (D-locus) coat color testing. Buying a puppy or breeding dogs that have been tested for these issues, as well as for hip dysplasia, can help maximize the quality of life of these gentle giants.